These are our favourite roasted eggplant and red pepper sandwiches. 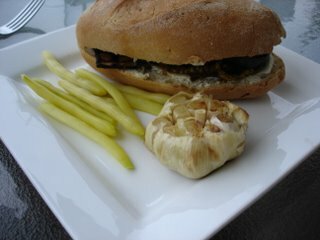 This night I decided to roast some garlic to serve with these tastey sandwiches. Roasted garlic is excellent smeared on your favourite crusty bread in the place of butter. I know all of you use garlic to ward off vampires, but did you know that garlic has a whole host of other health benefits? Numerous studies have demonstrated that regular consumption of garlic lowers blood pressure, and decreases platelet aggregation, serum triglycerides and LDL-cholesterol (the potentially dangerous form) levels while increasing serum HDL-cholesterol (the protective form) and fibrinolysis (the process through which the body breaks up blood clots), and stimulating the production of nitric oxide in the lining of blood vessel walls, which helps them to relax. As a result of these beneficial actions, garlic helps prevent atherosclerosis and diabetic heart disease, and reduces the risk of heart attack or stroke. Garlic is also known for its anti-inflammatory, anti-bacterial and anti-viral activity - so eat up to boost your immunity. mmm. I adore roasted garlic. It's amazing how sweet is creamy it turns. wow ... so I actually set up a "blog" here so I can chat with you. The emails keep getting bumped. So I now have one that I am going to tinker with so check it out. I always have lots of garlic around. You never know when a vampire might just suddenly show up. It's mighty tasty as well. Roasted garlic is so delicious. Nice photo! What gorgeous, gorgeous photos you take. Tip of the hat to you and bookmark for me. Love the food. Yep, count me in w/megan here... loooooooove roasted garlic for its creamy, sweet goodness. btw, dragonslayer, My e-mails to you, like fusion boutique, are getting bumped as well! I don't remember seeing the first post of this, but I usually do not have eggplant on hand either. I do now, so I think this sandwich looks super yummy! Also the roasted garlic, I've never had that before either, but I'm going to try it very soon. Thanks! kleo and Jewell... can you try to send me another e-mail? I was having trouble with my e-mail about 4 or 5 days ago but everything is supposed to be working now. I would like to confirm that you can both get e-mails through now. Yep- I basically can't go a day without garlic. And I more than smother it on everything I eat. I'd love to hear how you make your roasted sandwiches- it sounds delish.